With the introduction of Windows 7 Microsoft has made a change in policy and they have not included a desktop email program. That is to say there is no Outlook Express, no Windows Mail. They do offer the option though to install - for free - Windows Live Essentials, which includes Windows Live Mail. 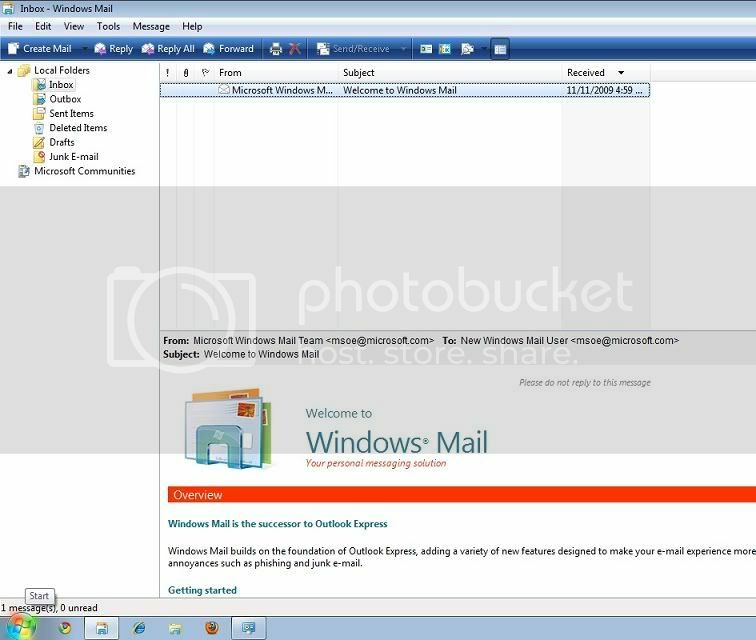 First point: Windows Live Mail has been made to look like a desktop mail program, but it isn't one. I'll explain the differences and why you need to know these differences! Second point: you are not obliged to use Windows Live Mail - there are other options. Ok, concerning the first point. Windows Mail and Outlook and Outlook Express are the desktop emailprograms Microsoft has offered us so far. A desktop email program is a program that is installed on your computer and which stores the emails you have received and the ones you have send and concepts you have made ON YOUR COMPUTER. Windows Live Mail has taken your program 'into the cloud'. That means it is a webbased application. So the emails you've send, your concepts and your received mail are stored on a Microsoft server. - you can access your email where ever you are as long as there is a computer with an internet connection and you remember your password. - your emails and contacts are stored on servers who generally keep good backup options themselves, so you need not worry about loosing your data if you suffer a computercrash. But there are also disadvantages and you need to take note of these! - your personal data is stored out of your reach. Microsoft tries to tell you your data is safe, but a lot of supposedly secure data servers get breached. Just recently there was a topic here on this very forum (will add link when I find it again) that a list of passwords had been made public and thousands of people had to change their password and hope they would not be the victim of identitytheft. - and how morally just is Microsoft? Will it give up your data to some government, just because they ask for it? These are the big moral questions, but there are smaller issues too. - you need to use Hotmail, MSN or Live to be able to use Windows Live Mail. Other email won't work. (So if your DSL server provides you with a free emailaddress you can't add it to Windows Live Mail like you could to Windows Mail). - and this last point allows Microsoft to add advertisements into your personal mail whenever they feel like it. - and for those who like to give their email a nice look: webmail just doesn't cut it. And since it is clear that Incredimail is a bunch of spyware nicely formatted eml files will be a thing of the past. Ok, now what about your other options? Thunderbird might be a good option (haven't tried this one either, since I use Windows Mail myself. I'm about to give his one a try though - will post back on that later. Edit: tried it and it is rather ok, but what I like most is the icon and there it ends LOL. I prefer Windows Mail, but that is just a personal choice.). And what I plan to do? Well I guess I wíll be using Windows Live Mail. But not as my primary emailclient. It has it's advantages and I use msn and hotmail a lot, so this is a logical step to take. It's good for casual contacts and quick, not-so-important messages. But next to Windows Live Mail I will be using Windows Mail of a similar app for my personal email. The more serious stuff like correspondence concerning my place of work, correspondence with friends on a more personal level, where I include personal pictures etc. etc. Or when I want to send someone a really nice email with a specific font used and beautiful stationary etc. etc. * don't be fooled to think Windows Live Mail is "safe"
Update: I just installed Windows Live Mail. That was just about the scariest install I have ever made. But some of the points I stated above need modification. - as far as I can see (and ok I've been looking at this for only a short time now) it signs in to your live ID and you're connected to your email there. I saw the meewee I have in MSN pop up in the corner of my Windows Live Mail, so I'm 'visible' there as logged in. But hey, that's the same as being visible on MSN. The connecting part has to do with the webbased email, not with the other accounts. But my pop3 email automatically got transferred to Windows Live Mail too. all the accounts can be found with their folders and email messages get stored there as eml files! So that's a good thing - your POP3 will still work as POP3 email. And the option for stationary is still there too, but mind you - when using webbased email you can sénd email, but in a reply the format get's lost. But the scary part is that it imports all this on it's own. Doesn't ask a thing. All your contacts from Windows Mail etc. are transferred to Windows Live Mail. I also came across 'contacts' that I've never added as a contact, but who simply send me a single email. Gosh, isn't that making life easy for spammers? And it is not clear to me if these are therefore also accessible from hotmail, which - if that is what happens - I find a huge breach of privacy. Edit: checked on the windows live website, but no these contacts are not added to the list there. That was a relief. Another thing I don't like at all is that it is very messy. Each account has it's own set of folders, but there are also general folders and at the bottom folders you created yourself in Windows Mail. In those folders I find the emails I've sent over the past couple of months. They are all there, all in eml format. But they have different names than the ones in the folders Windows Mail creates. So you never know which one is which (in case you wanted to clean them out and delete duplicates ...). And to install Windows Live Essentials you have to agree to their policy: they wíll collect data about your behaviour on their sites and when using their services. They can give you a lot of bla bla about doing it to better serve your needs, but whichever way you look at it, it is an invasion of privacy. I have only agreed to it in order to test this program out, but for me it is more than enough reason to uninstall the lot. Another thing that bothers me is that in C:\Users\*username*\AppData\Local\Microsoft\Windows Live Mail I find my accounts all set as subfolders, each with their own folders, BUT there is also a folder called Sentinel with eml files in it. Where the heck does that one come from? I understand the folder Calendars - I imported those myself. But I can't place Sentinel. All in all, it is not as bad as it's supposed to be <LOL>, though it is still downloading all the email I stored on my hotmail account (may take a while LOL) and adding it as eml files on my computer. So it get's to be a bit double: emails are still on the server ánd they are on my pc. I think this is not as bad as it seems. I still resent the MS policy to collect your data. Just as much I resent Google for it, but hey it is the best searchengine around if you want to find something fast and there is a lot of data no one will ever have a use for if they know about it. If someone knows you go to the shop to get some bread, he's collecting personal data. But we have to admit: generally it's not going to do you harm for him to know so. So it's probably not going to hurt you to share some data, but do be careful - that's all I'm saying. Big brother is watching you. No need to go and feed him! Will post some screenshots later. Well researched and written information. I am sure this should clear any doubt about using Windows Live Mail. I just tried to copy the Windows Mail folder from Vista to Windows 7 "Programs Files" Folder and it worked without any issue. I had never configured Windows Mail since I am using Outlook. I'll be glad if I can just take my Windows Mail with me to 7, but I think Windows Live Mail has it advantages too. Even if it would only be to read your hotmail / gmail / yahoo mail without all those advertisements. Cloudeight or Carol Oyl stated somewhere that Windows Live Mail enables Microsoft to insert advertisements at will into your personal mail. That made me very much set against it. But so far all I can see is a lot less advertisements! If it stays like that I will be using this as thé way to read hotmail emailmessages and have the advantage they are stored on the server in case I suffer a crash ánd have them stored as eml on my pc, so they're in my control. Of course I will never use hotmail and the likes for 'serious matters' or for storing passwords etc., because that is an accident waiting to happen. But for more casual conversation hotmail etc. has become far nicer. And adding a new account to Windows Live Mail is easier then in Windows Mail. That also has to do with Windows Live Mail grabbing info from all corners, regardsless of your consent, but it does take the hassle out of setting up hotmail, gmail, yahoo and live. First - typically Microsoft: make sure you untick what you don't want to have! Second - what it looks like after installation and after it has run it's course with importing of whatever it feels like importing. (I haven't seen anything that enabled me to stop this behaviour, but fortunately you can easily delete whatever is imported that you don't want there permanently ;D). Edit: and this is how it looks when Windows Live Mail is collecting the mail from your hotmail account. Has anyone tried to perform an update from Vista computer in which it had Windows mail configured to Windows 7 and checked what happened to their emails? :( I tried, Santo, but because I choose another language for my upgrade I can't do an inplace upgrade and it has to be a custom install. So I still don't know. I am sure someone should have tried, lets wait and see. Just had to reinstall Windows Live Mail, because I had to go back to an image from last week. Funny thing is: all the contacts from my pc were added into Windows Live Mail ánd this time they appeared in the addressbook of my hotmail also. NOT pleased with that. Too intrusive for my taste. Funny thing is it downloads messages to your computer (you can retrieve them as eml messages), but when you delete an email from let's say your inbox, it is deleted from your hotmail too. This is an excellent thread. Good work guys! All credit goes to Sarah. Do you have any idea what happens if someone using Windows Mail in Vista upgrades to Windows 7? Will Windows 7 automatically download Windows Live mail along with other Live Essentials so the mail can be setup? Edit: Santo - I've also ordered me 7 Ultimate in Dutch, so I can do an inplace upgrade. Holy cow. I don`t envie you guys what you have to go thru. I am so glad and lucky that I use AOL. Zero transition problems from one system to another. When you have installed Windows Live Mail you should be able to access it through Windows Live Messenger by clicking on the emailicon there. If that still opens webmail for you, you have to make sure 'automatically log on to Windows Live Messenger is ticked on. And because I use Windows Mail as my default emailprogram I've made sure Windows Live Mail is nót my default app. You can see that on the bottom of this same tab. I have been a passionate Eudora user for years and years. Have thousands of messages stored in Eudora Folders. But Eudora won't work in Windows 7 and it's unstable in Windows XP Mode so I tried Windows Live. Hated it. No, I REALLY hated it. It's a "my way or the highway" sort of program with no options to control when it downloads, what it does on the server, etc. I'm now trying Outlook 2003. Don't hate it, but it's not even half as good as Eudora. And it won't import my Eudora files or my Eudora address book. I'm sick about this............. But at least it's an alternative to Windows Live! I installed Thunderbird in my Windows XP Pro installation, but it doesn't seem to work properly for me, and as well, it doesn't indicate that its compatible on Windows 7. I know exactly what you mean when you say 'my way or the highway'. That's why I use it for my hotmail (I've got to admit it is an improvement on the webmail version) and not for my other emailaccounts. You mention Incredible mail as an option but as not that up on computers not sure if the comment re spyware was good or bad. My brother is always trying to get me to use Incredible mail but resisted so far but he has just ordered a new computer with window seven so any info helpful. I still use Outlook express on XP. As far as I understand it Incredimail uses rootkits and is a form of spyware, so I would definitely NOT use that. I'd strongly advise your brother against installing it on his new computer! You have made my day, cannot wait to send this to my young brother. Have you tried the Windows 7 upgrade from Vista as mentioned in one of your previous post? I'm eager to do it now, since I probably will be able to do an inplace upgrade after all (thanks to Vistalizator), but I just can't afford to work on funstuff right now. My brother says thanks but does not agree with Incredimail being spyware. says see http://www.longbraid.com/incre.....yware.html There is a link to a privacy statement on that site. Vista, now Windows 7. It does everything i need it to. possible. i don't trust google or yahoo much more than i do MS. This is a great post for information. I still have a few questions about upgrading from Vista to Windows 7. I have an HP laptop that had Vista and came with an upgrade for Windows 7. When I did the upgrade I did not know I could take Windows Mail folder to Windows 7, and paste it in the folder Program Files and have Windows Mail on 7. Since I have already done the upgrade and no longer have Windows Mail, only Windows Live Mail is there a way to still load Windows Mail? I prefer it because it allows sub-folders in my email storage folders and Windows Live dose not. One more question: I now have an icon on the desk top, DOCUMENTS AND SETTINGS. It seems to have all everything that is in MY DOCUMENTS plus some old stuff. Is it the same thing, and can I get rid of one of them? Hi owsjr. Welcome to HTG. Could you post your question in a new topic please? Thank you. Thanks for the excellent information ! I had a problem with Livemail also.I send & receive several emails a day to & from several friends. I decided to try Win 7 as a dual - boot to try to find a successor to Outlook Express. The biggest problem I found with Live Mail is that if I put more than 5 or 6 names in the "To" field, it told me to remove some of them. Huh? The Master/Slave thing seemed totally skewed. things I didn't need while not addressing the basic need to send a simple email. I couldn't get Thunderbird to import the addresses I'd exported from OE in either comma deliminated text format or csv format so I never gave it a chance. and manually enter your ISP password) , but it's a free download from the Microsoft website and works well. OE is the only desktop email programme I've found that will allow you to create folders containing multiple users email addresses. Outlook almost gets you there, but if you attempt to temporarily remove a name from the folder, it removes it completely from the program. Hope this helps somebody. Thanks for that input, Briankay! Santo, can I copy the Windows Mail folder from a computer that has Vista (burn CD) and put it on my clean install of Win 7 to avoid 'Live'? Just use seamonkey. Web browser and email client in one. Very informative reading. There appears to be some good and bad points with most email clients. I am trying to replace my current webmail and Windows Live is "NOT THE ONE" as it stores my personal info on MS servers. Tried Incredimail with all the Bells & Whistles but everyone said " BAD CHOICE". I am usinf Thunderbird but not really impressed. AOL is very good but not sure about their free webmail version. Gotta get away from Juno. Just moved to a new computer with windows 7 (from XP and a bit of vista) following this informative thread (thanks Sarah) I copied the "windows mail" folder from laptop to the program file in windows7. It did not work, clicking on winmail.exe did not appear to do anything, could not delete it, access denied. Looked at the attrib of winmail.exe there was a "H & S" there, I assume these mean Hidden & System. I recently read about someone else who had the same problem ánd solved it. I'm on my way out now, but I'll post back later when I have found that link again. (your name automatically appears on the left of your post). sarah, do you know how to or can you send or move a folder Ie:( my doc,s and family) to my documents in windows 7 ? from win,live/hotmail. object but for 'security reasons' only my thoughts mind you just asking your opinion. I think it is a better idea if you start a new topic for your question. You'll get more response that way.